How Can I Prevent Employees Disabling Location Services (GPS) on their Smartphone? Often employers ask if there is a way to require employees to leave Location Services (GPS) enabled on their mobile device. The good news is, you can prevent employees from disabling GPS. This feature works on both the Android app and iOS app (version 2.2.6 or higher). If you see a phone icon to the left of the time, then we received the punch but were unable to obtain location information from the device. This usually means that Location Services (GPS) is disabled. The Require Location Services (GPS) to Clock In Via Mobile feature is enabled at the employee level, either when adding an employee, or by editing an employee. 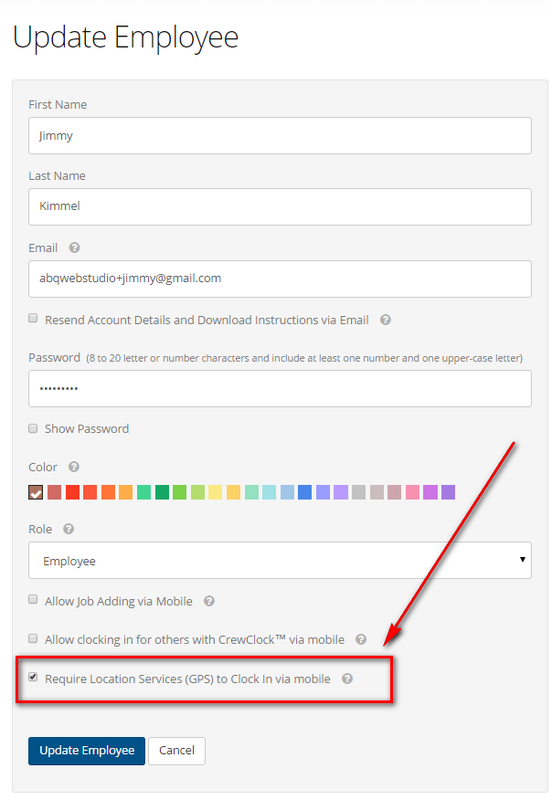 To enable the Require Location Services (GPS) to Clock In Via Mobile feature, visit the Employees Screen and click on the edit button to the right of an Employee to update the Employee. You will now be on the Update Employee Screen. Look for the box at the bottom of the screen that says "Require Location Services (GPS) to Clock In Via Mobile". Make sure the box is checked. Note- When first enabled it may take several hours for this feature to propagate to the mobile app and start working. To make it start working immediately, have the Employee log out of the mobile app and log back in.